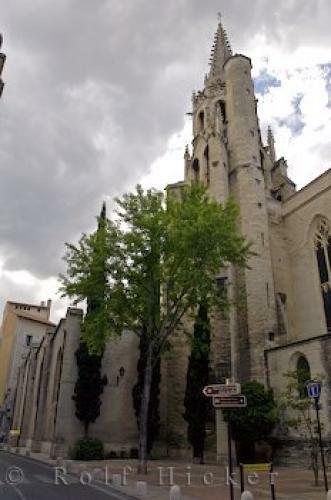 The beautiful Eglise Saint-Pierre in Avignon in Provence, France in Europe. ... The interior of the church has an outstanding ornamental white limestone throne from the 15th century, as well as an altarpiece depicting the Last Supper. The Eglise Saint-Pierre is the most adorned church in Avignon, France.Church, Eglise St Pierre, Avignon, Vaucluse, Provence, France, Europe. I photographed this photo with the digital SLR camera model Canon EOS-1Ds Mark II, aperture of f/7.1, exposure time of 1/80 sec. on ISO 100, as always I used a original Canon Lens, the focus lenght for this picture was 28mm.